Reason: It was part of the Amazon Spring sale, I almost didn't buy it as I find the whole Titanic thing spine chilling but in the end the reviews and price encouraged me to buy it. She was the most magnificent ship ever built, yet on the eve of 14th April the Titanic sank in the North Atlantic, leaving the lucky ones floating in wooden rowing boats, and the rest struggling for their lives in the icy water. 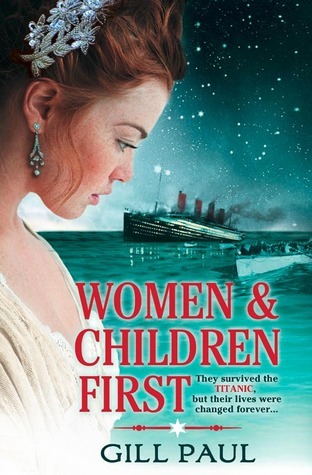 The sinking of the Titanic not only steals lives but blows apart the futures of those who survive: Reg, a handsome young steward who works in the first class dining room: Annie, a gifted Irishwoman who is travelling to America with her four children: Juliette, a titled English lady who is pregnant and unmarried: American millionaire George Grayling and his wife Margaret who are trapped in a poisoned marriage; and a mystery passenger who never shows her face in public. As each of them tries to come to terms with the aftershock of the fateful night, they must begin to rebuild their lives. But how can life ever be the same again when you've heard thousands of people dying in the water around you? I haven't ever really read any books on the Titanic or have ever learned about it at school which is probably one of the reasons I was wary about buying it first. Also as I said its one of those subjects that also makes me cringe as I don't want to imagine at all what it was like but maybe sometimes it worth reminding ourselves of how lucky we are but also how quickly things can change. The second part I did enjoy but not as much as the first. I couldn't take to the characters at all and found I just wanted the book to end as it was just getting weirder and weirder... the situation with Reg when he is at George's house with the chef and then on a holiday. Juliette I couldn't take to at all, she just seemed like a brat from day one which is probably why she found herself pregnant in the first place. She just came across so selfish and the epilogue at the end just confirmed it considering what her husband was willing to do. Mr Grayling and his situation was just annoying..... I'm glad they told us of what happened to Mrs Grayling but I would have loved to have known what happened to Reg's friend John. Annie and her ability to contact the dead was the icing on the cake really but I guess it was maybe to emphase what people might have attemtped to do in their desperation in wanting to know what happened on that night to their loved ones. Some may have wanted to believe that they were still alive and this was their only hope of confirming it.